This alternate history coming-of-age YA is the Winner of the 2018 Storylines Tessa Duder Award. "An inferior people, that's what the Director called us at the beginning of his reign, but still useful. "There are two peoples living in the city of Ursa: the Cerels and the Travesters... read full description below. This alternate history coming-of-age YA is the Winner of the 2018 Storylines Tessa Duder Award. An inferior people, that's what the Director called us at the beginning of his reign, but still useful. There are two peoples living in the city of Ursa: the Cerels and the Travesters. Travesters move freely and enjoy a fine quality of life. Cerel men are kept in wild camps and the women are no longer allowed to have children. The Director presides over all with an iron fist. Fifteen-year-old Leho can't remember a time when Cerels lived without fear in Ursa. His parents once tried to organise an uprising - his mother was blinded, and his father was taken away. But now his world is changing. Revolution is coming. People will die. Will Leho be able to save his family? 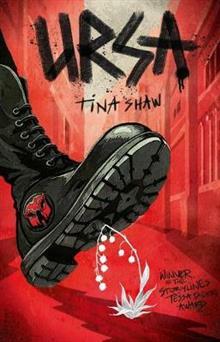 Tina Shaw has written several books for young people. In 2010, About Griffen's Heart was a Storylines Notable Book and was short-listed for the LIANZA Children's Book Awards. Her other publications for younger readers include the fantasy novels Into the Hinterland and its sequel Dogs of the Hinterland, and her most recent YA novel is Make a Hard Fist, to be followed by its companion novel, Gun-Metal Blue. Ursa, the winner of the 2018 Storylines Tessa Duder Award, is her first novel with Walker Books Australia.